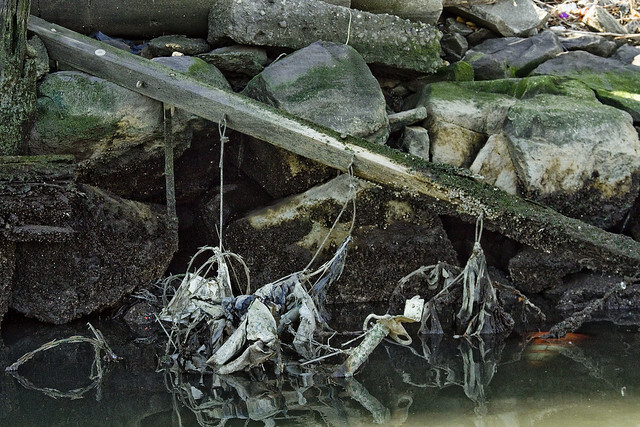 Bulkheads of the Newtown Creek, in today’s post. Some are designed for docking ships and boats, or tying up barges, others simply as barriers. Most of the shoreline along the Creek has lost its occupation over the last century, as business adopted a truck and automobile based model for shipping cargo. 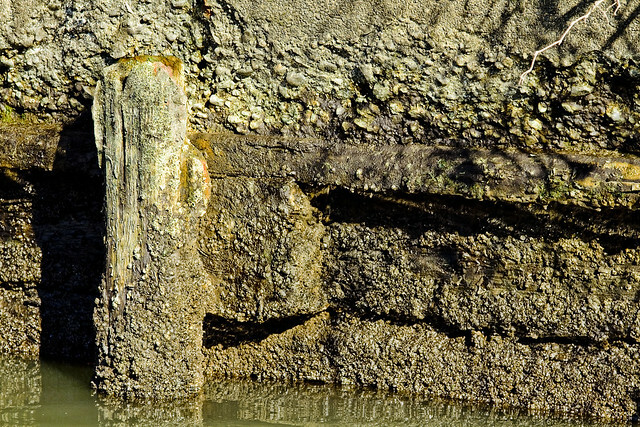 Lack of maintenance and the corrosive forces of nature have caused the bulkhead structures all over the Newtown Creek to decay. Some have collapsed. 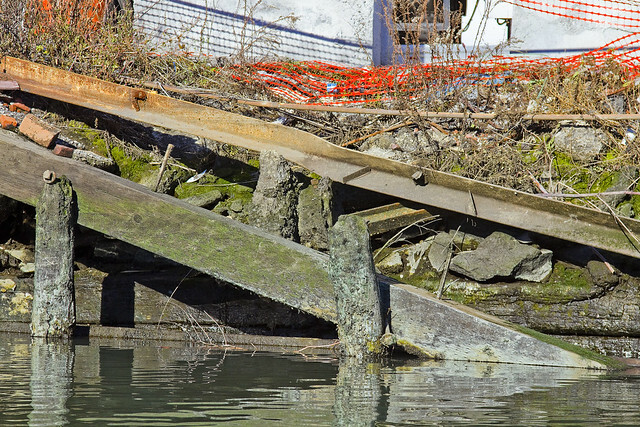 When a bulkhead has actually fallen apart, as seen above and below, it is considered to have become “habitat” by environmental officialdom. 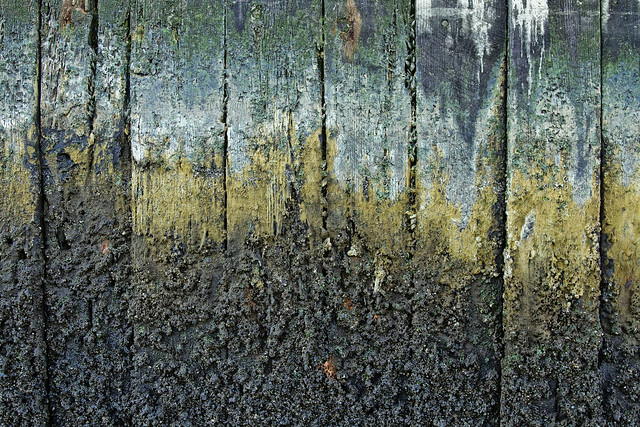 Close inspection reveals what sort of life forms have taken up habitation in the cracks and fissures of what were once amongst the most valuable maritime bulkheads on Earth. A bit higher up in the tide line, and a rip rap shoreline. Rip Rap is basically a series of small boulders and large rocks which are dumped along shorelines. The good news about this sort of tidal liner is that it offers a tremendous amount of surface area for the aforementioned colony creatures to attach to, as well as macro organisms like barnacles, clams, and oysters to grab onto. The bad news is that there’s a lot of concrete included amongs the rocks and boulders, and as concrete decays the lime in it causes the water’s ph to rise and become acidic. There’s also lots of “mystery pipes” that emerge from the shoreline hereabouts, as depicted above. 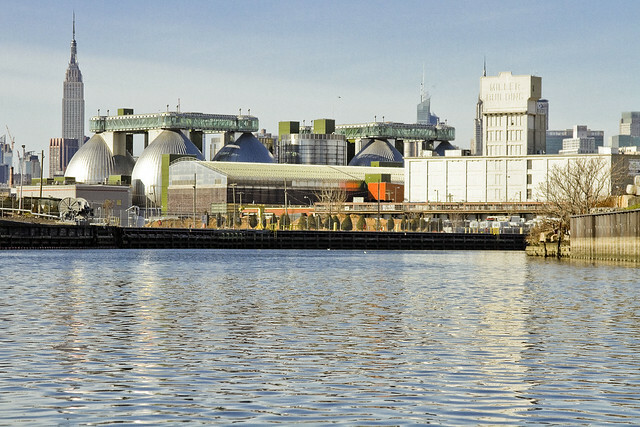 The National Grid company, which operates an LNG distribution and storage operation at the former Brooklyn Union Gas Manufactured Gas Plant site in Greenpoint, doesn’t allow docking at its bulkheads. Accordingly, they erected a wooden shield all along the edge of their property. This sort of thing is actually a gigantic box driven into the mud that is filled with rip rap. The wooden planks provide ample attachment sites for colony critters and filter feeders. 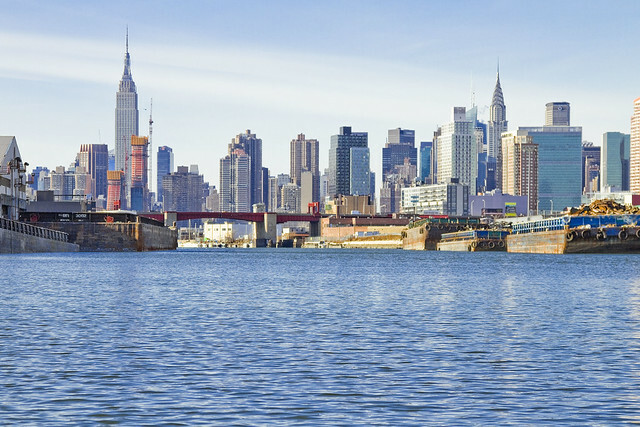 This is a part of the Newtown Creek which is referred to as “The Turning Basin” and it is an engineered wide spot designed to allow a tug and articulated barge enough room and depth to be able to safely reverse course on the otherwise narrow waterway. 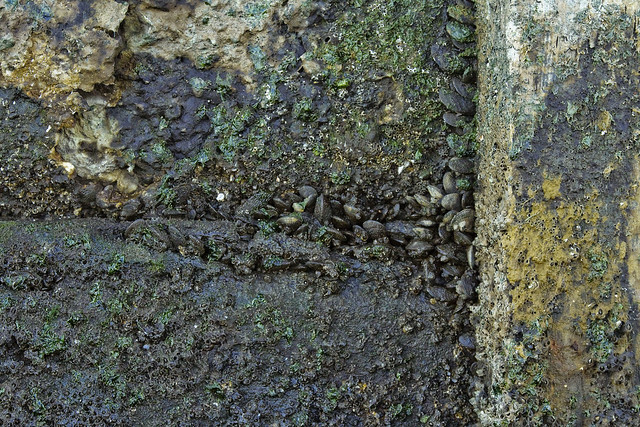 A close up of a colony of Mussels attached to the National Grid bulkhead. One of NCA’s science people, a certain radical biologist, coined the term “Kidneys of the Creek” for filter feeders like this. Each mussel is able to process “x” number of gallons of water, and remove “y” amount of solute from it. Of course, this means that the Mussel itself becomes a concentrated blob of toxicity, but the sort of Mussels you commonly encounter on Newtown Creek aren’t the species which are part of the human food chain. On the Creek, it’s the fish and crabs. The fish and crabs which people catch, and then eat, that they gather from Newtown Creek. Yes, you did just read that. The Federal EPA has confirmed this fact. You encounter masonry rising out of the water, which is capped by concrete, in many spots. This particular spot is about three miles from the East River. There are lots and lots of apertures in the shoreline here, and lightless chambers and flooded voids which recede beneath the “land’s” surface. The word “land” is in quotation as the area which touches the water, with just a few exceptions, was primevally a swamp or at best a flooded marsh. There is no true land, certainly on the Queens side, for a good half mile back from the present day shoreline. It’s all landfill, of the 18th and 19th century variety mainly – rubble, domestic and agricultural waste, ashes and cinders from furnaces and residential hearths. 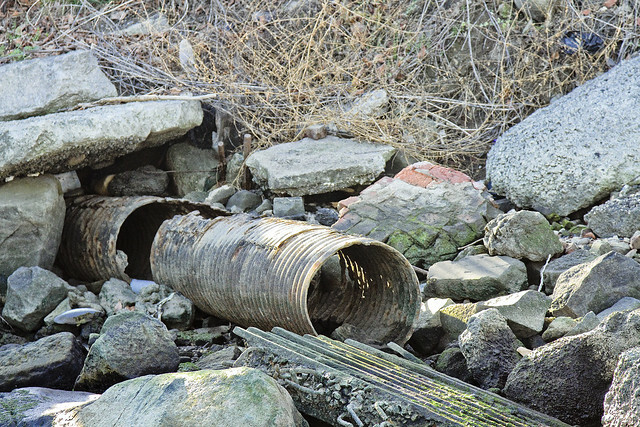 The areas around Grand Avenue, Maspeth Creek, and Dutch Kills, were largely reclaimed in the early 20th century and the ground is filled with more modern crap. 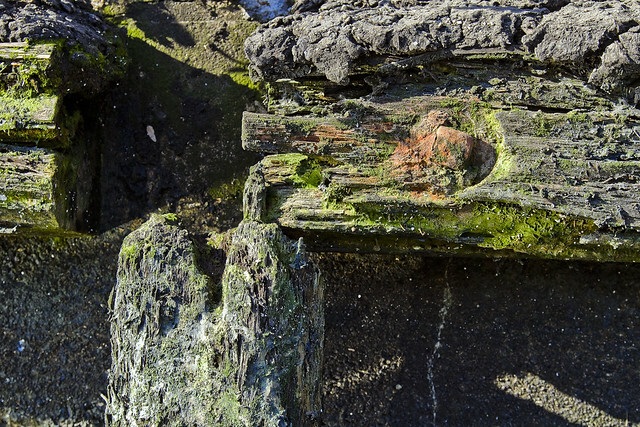 Nearby the Maspeth Avenue Plank Road, Brooklyn side, a bulkhead of the same variety enjoyed by National Grid is in the process of collapsing and you can discern the internal structure of the thing. A creosote oil treated wooden box filled with rip rap. Self seeded, the plants you see are thorned and I can attest that those spikes will easily find your tender skin if you venture close enough. 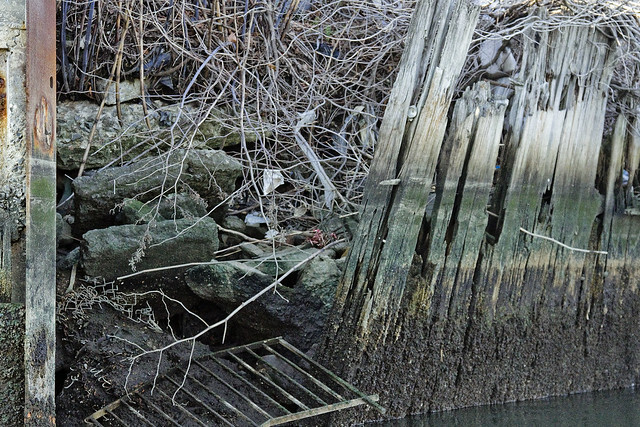 A little further to the west, on the Brooklyn side foundations of what was once called Penny Bridge, nearby the pipe which ExxonMobil returns water to the Creek which was extracted from their Greenpoint Oil Spill remediation efforts. I cannot tell you why anybody decided to hang razor barbed wires from bits of cord, but this improvised filtering technology does seem to be removing “floatable” pollution from the water in an admirable fashion. A Bulkhead Survey is something we Newtown Creek Alliance folks do from time to time, in pursuance of our mission to “reveal, restore, revitalize” the waterway. It’s a lot more fun than sitting in a bunch of meetings and arguing with regulators and corporate types, I can tell you. We don’t do the former it all that often, whereas the latter seems to be at least once every couple of weeks, but there you go. My job in this sort of endeavor is to sit sideways in the boat and take a series of pictures, one shot is popped off every time I count to five mississippi, depending on how fast the boat is moving. Ideally, we go out at low tide, when all the poisons hidden in the mud hatch out and stand revealed beneath the burning thermonuclear eye of God itself – along the lugubrious Newtown Creek.